After last weekend’s racing, we’re a quarter of the way into the WorldTour season, with seven of the 28 events now completed. So how are the standings shaping up? The current UCI rankings underline just how big a force Britain has become over the past few years. 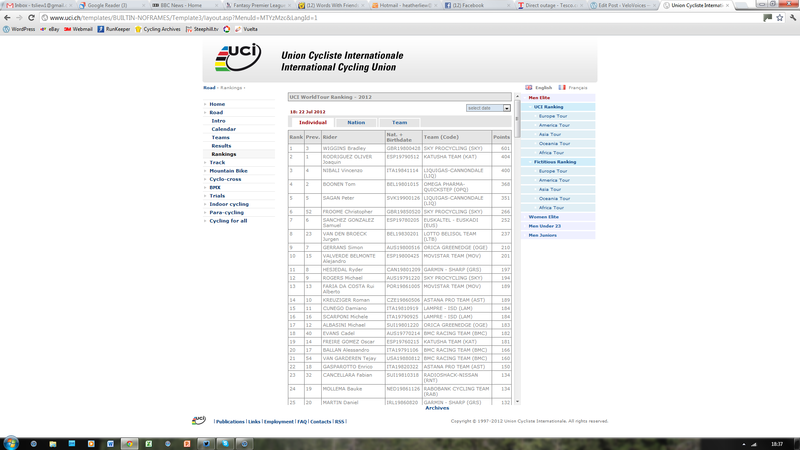 It should come as little surprise to find Bradley Wiggins sitting atop the individual rankings. Two individual time trial wins and overall victory at the Tour de France – the first by a British rider, in the 99th edition of the race – catapulted him above Katusha’s Joaquim Rodriguez with an advantage of close to 200 points over the Spaniard, with Vincenzo Nibali (Liquigas-Cannondale) in close attendance after his podium finish in Paris. Wiggins’ success is no one-off either. He gained 266 points at the Tour (200 for winning, the rest for high stage placings), but also 100 each (plus change) for his victories at Paris-Nice, the Tour de Romandie and the Critérium du Dauphiné. And that doesn’t even include last week’s Olympic time trial win – his fourth gold and a record-breaking seventh medal for a British athlete – which does not count towards the UCI rankings. In seven time trials of 10km or over he has raced this year, he is unbeaten. It is a quite remarkable record. A knighthood (he already holds a CBE) looks about as inevitable as the sun rising in the morning and setting in the evening. Arise, Sir Wiggo. There is also a very good chance he will succeed teammate Mark Cavendish as BBC Sports Personality of the Year, which would make him the third winner from cycling in the past five years, following Sir Chris Hoy in 2008. Speaking of Cavendish, he is 27th in the rankings and missed out on gold in the Olympic road race but three Tour de France stage victories of genuine quality – the last on the Champs-Élysées after being led out by the yellow jersey himself – in spite of being a secondary focus were a vivid reminder of why he sports the world champion’s rainbow jersey. Let’s not forget he is only the second Briton to have earned the rainbow stripes (after Tom Simpson in 1965) and the only one to have won the Tour’s green jersey. Oh, and three wins at the Giro d’Italia too. It says much about the impeccable standards he has set over the past five years that this supposedly represents a ‘poor’ year for him. Almost forgotten in the frantic media scrum which surrounds Wiggins is Sky’s other British star, Kenyan-born Chris Froome. At any other time in British cycling history, we would be celebrating the emergence of our greatest talent for a generation. 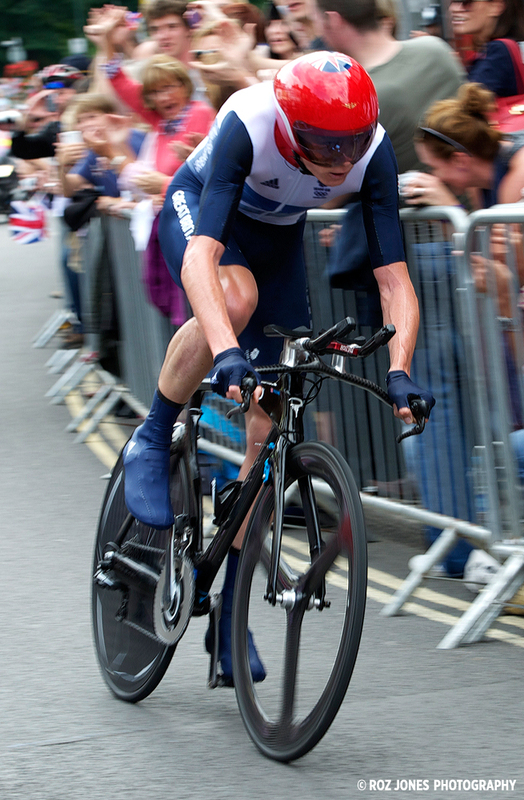 Second at both the 2011 Vuelta a Espana and this year’s Tour, he was second to Wiggins in both the Tour’s long time trials, and only a strong ride by world time trial champion Tony Martin knocked him down to bronze in the Olympic race. Nonetheless, his 206-point haul in France has catapulted him up to sixth in the individual WorldTour rankings, and another strong performance at the Vuelta will likely see him move into the top three and have teams clamouring ever louder to tempt him away from Sky for 2013. Three other Brits feature in the top 100 overall. Two are Sky men – Ben Swift (86th, 24 points) and Olympic team pursuit gold medallist Geraint Thomas (88th, 22 points) – while veteran David Millar (Garmin-Sharp) jumps straight in at 97th with the 20 points he earned with his breakaway win on stage 12 of the Tour. And other familiar British faces in the peloton include Ian Stannard, Jeremy Hunt (both Sky) and Steve Cummings (BMC), who earn their corn not with WorldTour points but in putting in the hard, unglamorous kilometres chasing down breakaways and setting tempo for their more illustrious teammates. It is not just the strength of the most elite names but the depth of talent which boasts a British racing licence that really shines through. It is a far cry from the days when the most impressive Brit on show at the Tour de France was TV presenter Gary Imlach. Sky’s three biggest British stars account for 995 of the 1,318 points which give them a handsome lead in the WorldTour team rankings, an advantage which is likely to be consolidated further by a top-ten placing (at least) for Froome at the Vuelta. 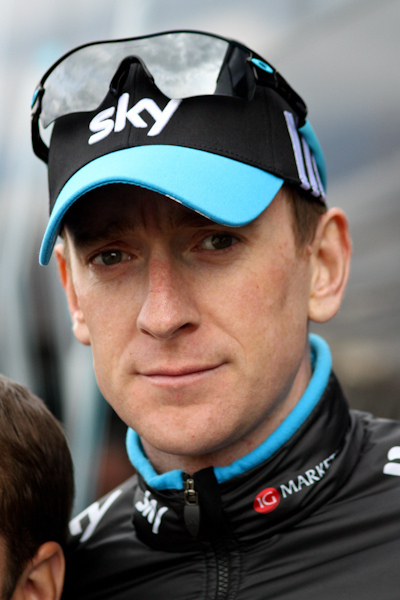 Such is their strength in depth – Michael Rogers, Rigoberto Uran, Sergio Henao and Edvald Boasson Hagen can also boast in excess of 100 points each this year – that even if one discounted all Wiggins’ 601 points, Sky would still be third overall in the teams’ table, trailing only Liquigas-Cannondale and Katusha. Or, looking at it another way, there are seven Sky riders who individually have more points than the whole of the Saxo Bank-Tinkoff Bank team, who prop up the rankings with a meagre 88 points. Beyond the WorldTour outfits, it would be remiss of me not to mention Endura Racing’s Jonathan Tiernan-Locke, who currently sits third in the Europe Tour rankings. The 27-year old has taken a slew of race wins so far in 2012: five stage victories and three overall classification titles at the Tour Méditerranéen, Tour du Haut Var and Tour Alsace. 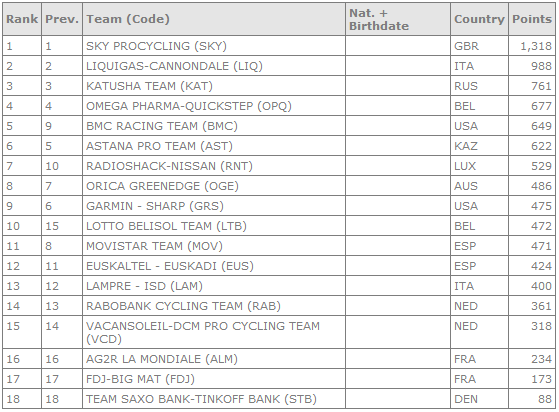 Overall, Britain is the third-ranked nation on the WorldTour (calculated by the total points accumulated by all riders of that nationality), trailing only Spain and Italy, both of whom contribute a much higher number of riders. Three years ago, David Brailsford essentially threw down a gauntlet which declared ‘The British are coming’. As the latest rankings amply demonstrate, it would be fair to say that the Brits have arrived, put their feet up on the coffee table and are happily consuming beer and a takeaway curry. And there’s no sign of them going away any time soon. The cycling world laughed at the audacity of Team Sky’s ambition then. No one’s laughing at them any more.